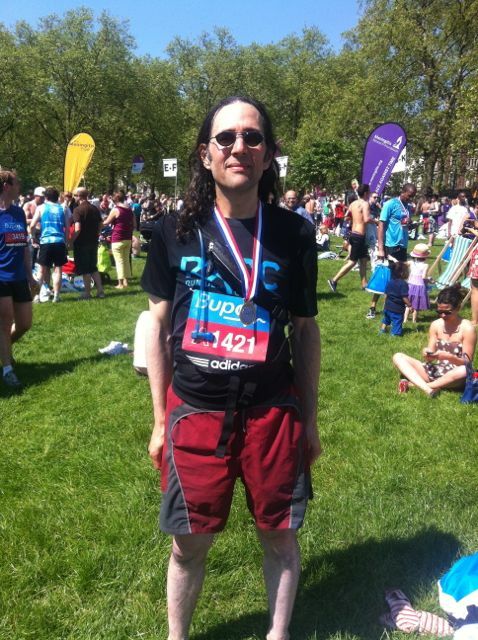 Today, thanks to Charlie Dark of Run Dem Crew, I was given an opportunity to run the Bupa 10K here in London. I didn't find out until Friday night that I was going to be running this race, so my preparation was not ideal. But I only took the place because I feel fit enough to take on a 10K without much advance notice, so no excuses. Once I knew I had the place (runner's shorthand for having one of the limited number of entries in a given race) I contacted my fellow Run Dem Crew member Melissa to see if she wanted to run the race together. I knew she had a place, and I knew we ran a similar pace. Sure enough, Melissa's target for the race was 50:00, and I felt that that was about right for me. I was up early this morning and double-checked the weather. Definitely some concern about the warmth and sun. In general we welcome temperatures in the mid 20s and cloudless skies here in England, but this is not ideal for a race day. Sure enough it was unpleasantly warm at the start of the race, and we definitely had to balance our desire for speed against the extent to which the heat was draining our strength. Turns out that Melissa and I make a very good team for a run. We did a great job of pushing each other, and of calming each other down when one or both of us tried to push too hard. We kept checking in with each other and with the time, and had had a really good talk about goals, strategy, etc. prior to the start of the race. During the run it was great to have so many people lining the course and cheering, and we especially appreciated seeing a couple of our Run Dem Crew compatriots, and hearing them call out our names. Really a nice lift! It was also great to be able to find patches of shade during the run, and we were really saved by the stretch through The City (we actually ran through Leadenhall Market) which was almost entirely in the shade. and highlighting some of the sites along the way. We were pretty much right on target through 5K, coming in at slightly over 25:00, with the plan being to try to pick it up a bit on the second half. We decided that we would save our big push for the last kilometer, it just didn't seem like a good idea to risk wilting in the heat before we got over the finish line. When we got to Kilometer 9 I tried to pick it up a bit, but definitely didn't have much left in my tank, so I told Melissa she should go on ahead. She initially refused, since we really had taken the journey together up to that point, but I insisted. She agreed but only after I promised to sprint for the last 200 meters. Deal. I picked it up as much as I could, and was happy to come to the sign marking 400 meters to go. Then hit 200 meters and gave it all I had left, finishing strong. Big thanks to Melissa for making me promise, I don't think I would have been able to finish as strongly without her making that part of our shared race experience. We thought, based on the times from our running apps, that we were right around 50:00, with Melissa slightly under, and me slightly over. My guess was that I was no more than thirty seconds behind her. When the official times came out we were disappointed to see that Melissa's time was 50:27, and mine was 50:46. Personal best for Melissa, and a strong first 10k for me. This page contains a single entry by Daniel Maskit published on May 27, 2012 10:25 PM. The Art of Not Training is the next entry in this blog.